This porridge is a creamy, dreamy and steady start to the morning and the flavour of the apples brings christmas to mind. I know it’s only October and I am not big on bringing christmas alive too early but this cinnamon apple topped creamy porridge gives just the right amount of christmas feeling for now. 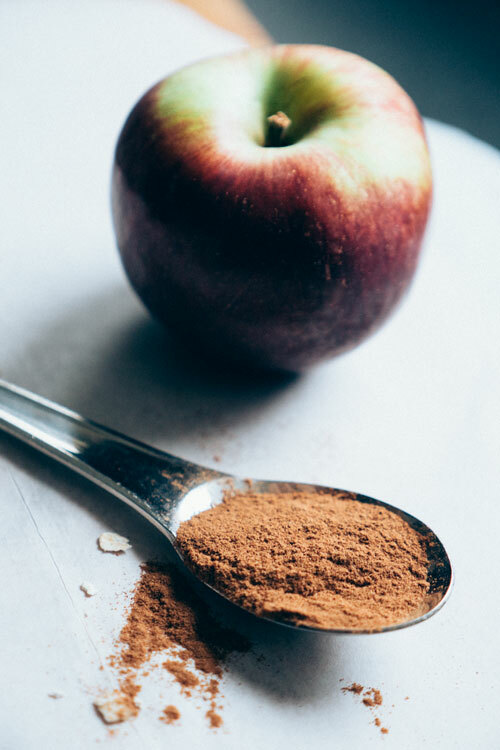 Apple and cinnamon can never be wrong, can it? 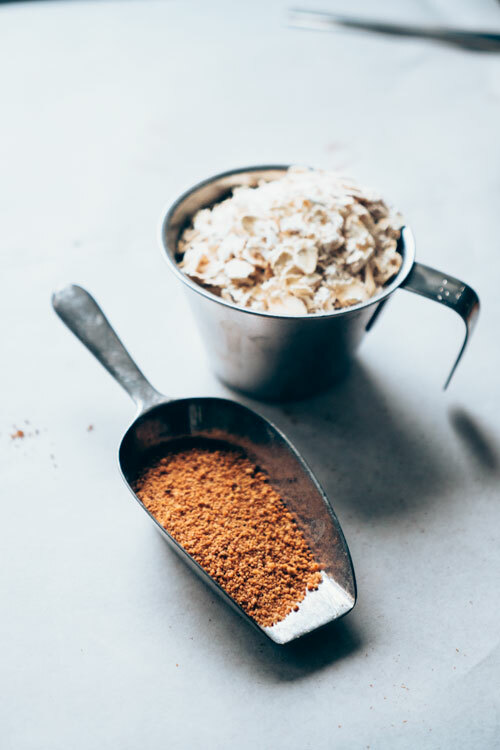 To create a really creamy oat porridge I add coconut milk and try to make sure that I get the thick part for at least half of the amount needed. 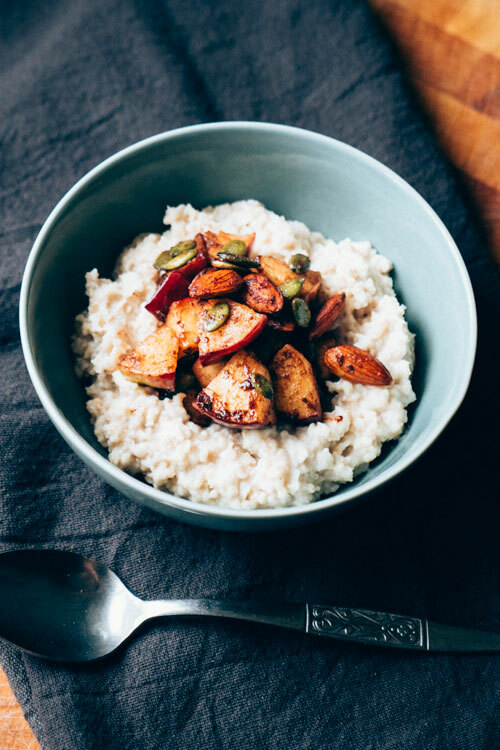 It also gives the porridge a white colour which is beautifully contrasted by the browned cinnamon apples with a touch of coconut sugar to follow the trend. 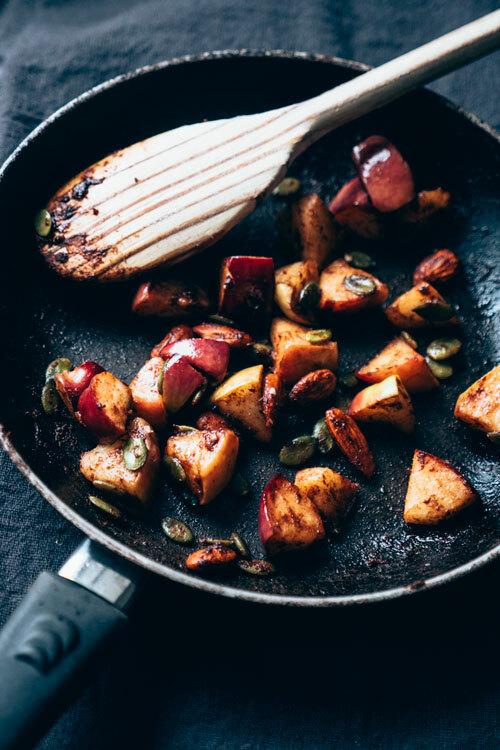 I also add some almonds and pumpkin seeds to the pan towards the end when sauteing the apples to give the dish some crunch and a bit more protein. Let’s talk about breakfast. I love breakfast! I know that many people don’t but I really am one of the believers when it comes to breakfast, it gives you a solid start to the day. It has been shown in studies that it help manage your weight as well as you are less likely to overeat later on in the day and more likely to keep your blood sugars level. 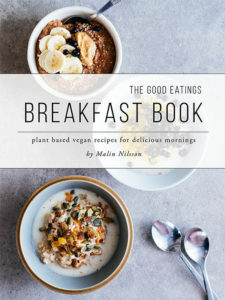 I really think breakfast keeps sugar cravings away and it can be such a comforting start to the day when you’re feeling tired and sluggish, which many people seem to this time of year (I know I do). Porridge, or oatmeal as many call it, is one of my favorites for breakfast and one reason is that it’s versatile. I never used to like it that much as a child because it was always a bit stodgy. It came with jam and milk which was usually more tasty than the porridge itself. But! Porridge really doesn’t have to be boring and this recipe which is really quick and easy proves that. Place oats, water and coconut milk in pot over medium heat and stir once in a while until all the water has been absorbed, then remove from heat. Meanwhile decore and cut apple into bite size pieces. Place coconut oil, apple pieces, cinnamon and coconut sugar in pan over medium heat, mix. Stir once in a while and after roughly 3 min add almonds and pumpkin seeds, mix. Leave for another 2-3 min and stir when needed. Place porridge in bowl and top with apple mixture. Enjoy this creamy cinnamon apple breakfast to set you up for a good day! Mmm, så gott det ser ut! Älskar också kombinationen äpple, kanel och mandel. Och tillsammans med gröt blir det ju toppen. Har inte provat koka med kokosmjölk tidigare, men det kanske kan vara något 🙂 Så roligt att jag hittat till dig och dina vackra bilder.